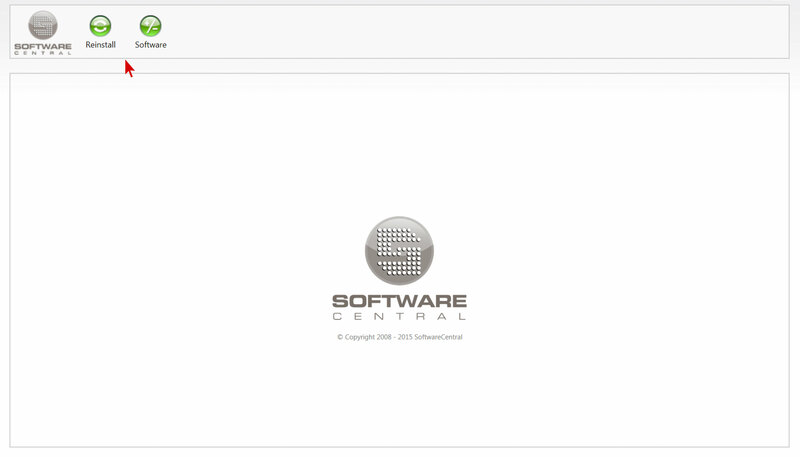 With SoftwareCentral you can easily delegate routine tasks, like the installation of software or cleaning computers, to the Helpdesk and Support staff. 1. 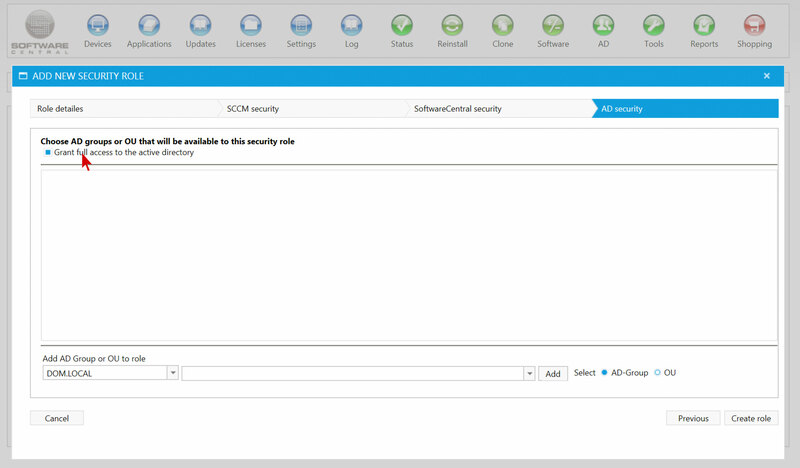 Under Settings you will find the function Security Roles. 2. 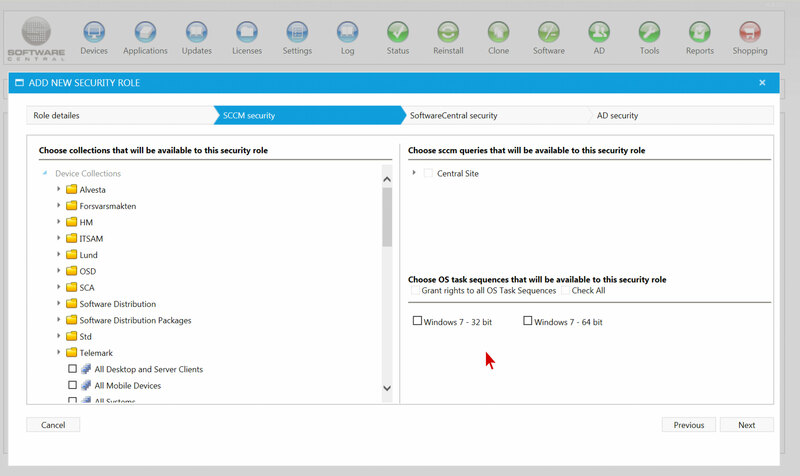 Here you can manage existing or create new Security Roles. 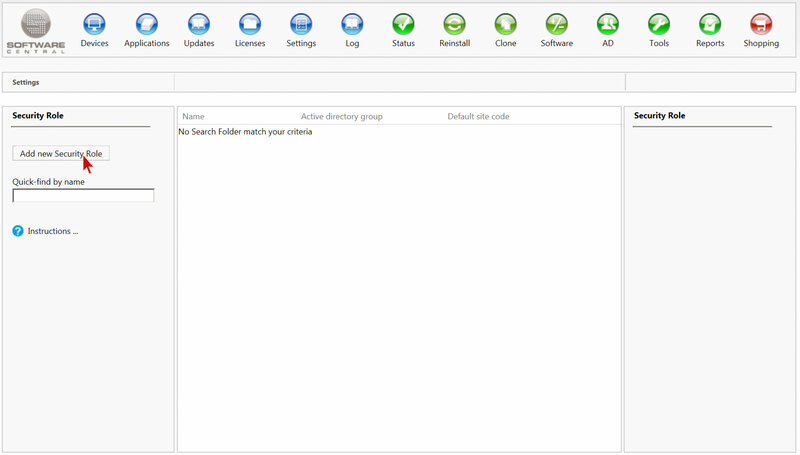 To manage an existing role you can search for it by name or choose one from the table in the center. Our table is empty because we have no active Security Role at the moment. We want to create a new one and click on Add new Security Role. 3. 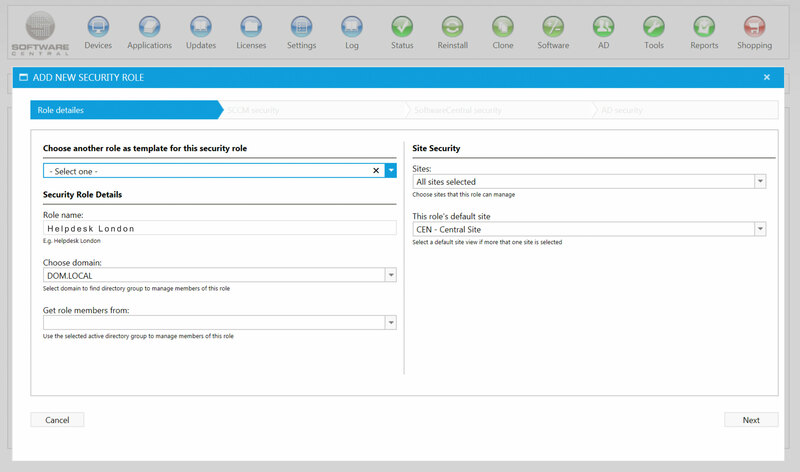 A new window opens up, where we can define the settings for the security role. We can choose an existing role as a template or we can enter the details manually. We create a name for our security role and choose our role members. Our Security Role is named Helpdesk London. Then we click on Next. 4. 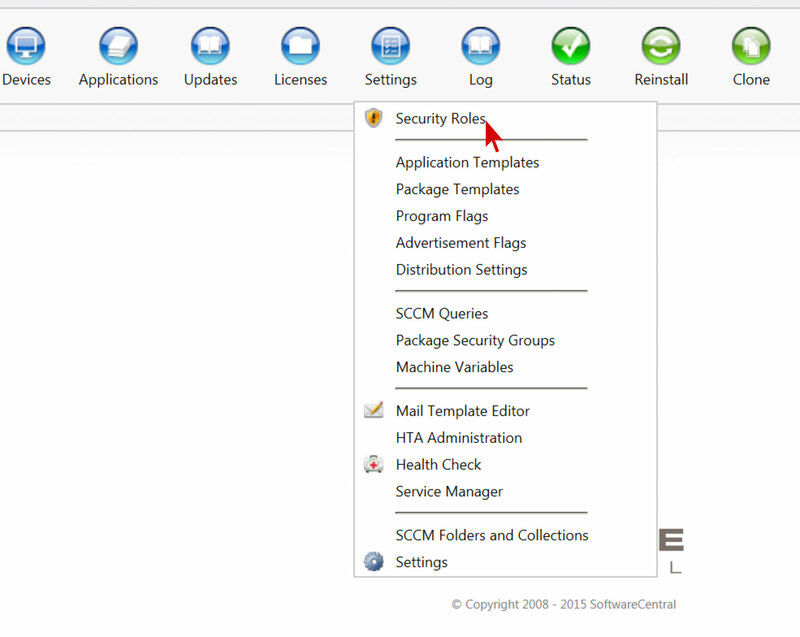 Now we can enter the settings for SCCM security and define to which collections our Helpdesk has access to. 5. Now we can delegate tasks to our Helpdesk. In our example, our Helpdesk is allowed to reinstall single computers and to manage software on single computers. For security reasons we decided to only give access to single computers, to prevent mistakes that would affect the entire network. 6. In the last step we can choose AD groups our Helpdesk has access to, in our case we grant access to the full active directory. When all settings are in place we create our Security Role. Now our Security Role, Helpdesk London, is visible in the list. If we want to make changes we can simply choose the Security Role and click Edit. When the Helpdesk London logs in to SoftwareCentral it will only see the two functions we gave access to – reinstall single computers and manage software on single devices. That way we can be sure no mistakes will happen that could affect all client PCs. 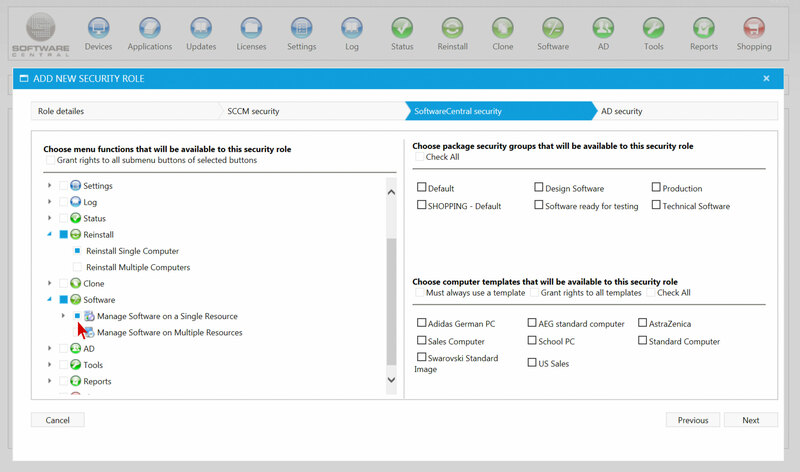 Creating Security Roles and delegating tasks allows the SCCM expert to focus on the more demanding tasks. An employee who needs a new software can simply contact the Helpdesk and gets help immediately, that way the workflow improves and all can work more efficiently.